Prepared crystal jelly and set aside . Now Add custard powder and sugar to milk and cook on medium flame till thick. Now in a glass bowl place 1/2 cake at bottom and pour some crystal jelly over it. Now add a layer of chopped fruits and then a layer of custard and then fruit layer at top custard layer. 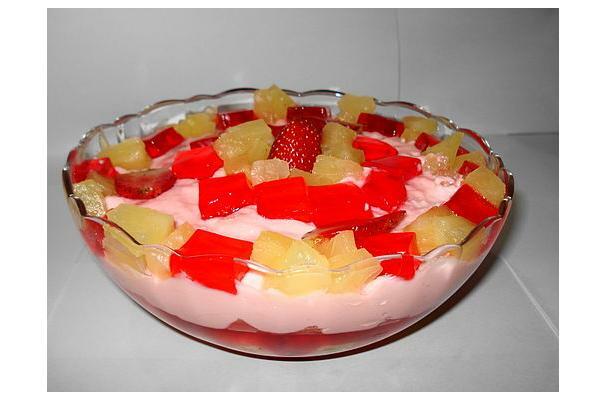 Decorate top with pine apple, banana, strawberry. Make decoration with thick cream. Delicious Fruit trifle is ready, cool and serve. Yum! reminds me of my childhood.